Sciblogs | Now the dust has settled, what did Lima bring? The final text of the ADP key agreement is here. The one big thing we can all work with is the aggregate number. The word “aggregate” snuck back into the text of the final outcome, deciding that the UNFCCC Secretariat must add up all the emission reduction commitments on the table, and work out how they look compared with the global agreed warming limit of 2ºC. Also good is the removal of the “review” that, by the time it got to its most recent iteration, had been reduced to a weak “dialogue” with governments “willing to do so.” At least it’s now mandatory for those numbers to be added up. But what information needs to be in these submissions? What level of detail? Will we get a range of numbers based on differing base years, or GDP, or changes in energy intensity, or peak years? How will we compare them to know who’s doing better? Will we be able to? This is not the ideal way to get to where you want to be. But at least we will have a number we can work with. That the final deadline for these commitments is 1 October and that the UNFCCC has only one month to do this work is troubling and difficult. That’s not much time for any campaign at national level to try to get higher ambition from a government, not much time for international shame to be wreaked on an individual country not doing enough. How New Zealand behaved in Lima was a little like that story of that Emperor with a new set of clothes. Tim Groser was at pains to point out to anyone who was listening that we have a great ETS that’s working, and that we will meet our 5% cut in emissions by 2020. Neither he nor our presentation to the COP gave any rationale as to how this will be met other than trading our way out of the problem. The MFAT head of delegation Jo Tyndall gave a rousing presentation of – erm – tourism slides – to the Multilateral Assessment. It’s worth a watch for anyone interested in seeing how we present our terrible climate policy to the rest of the world. All the other countries presented their figures in clear tables and figures. But New Zealand’s presentation had just one slide with a table in it (pictured above) – that stayed on the screen for about ten seconds. Had she lingered on this slide a little longer, the audience might have been able to see that our net emissions are set to rocket over the next 20 years. 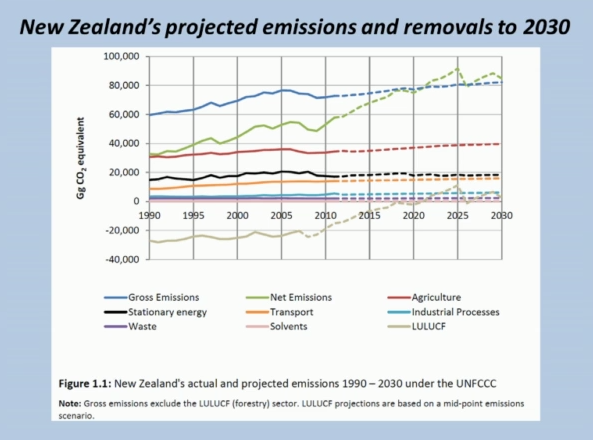 Under questioning, Tyndall admitted that the way New Zealand measures our emissions profile means that we cannot measure the impact on our emissions profile of specific policies. Yup, that’s right. New Zealand can’t actually measure the effect of policies on our emissions profile. How can that be? I still don’t have answers as to how we’ve managed to do this and get away with it. But it raises an obvious question: if we can’t measure the impact of policies, how do we know what are the right policies to reduce emissions. Or does the Government not really plan to introduce them? Next year will present two challenges for our Government on the climate front. The first is the review of our Emissions Trading Scheme. Will it actually be strengthened? Will it bring in agriculture? Then we will have to review and increase our reduction target to 2025 or 2030. Big emitters like China are now on board. China has already made a pledge that, while difficult to count, still looks like it’s going to make a huge difference to global emissions, Mr Groser has no reason to hold back our own emissions reduction target. China has been the Big Bad Excuse for doing nothing back here in NZ for a very long time. But now it’s moving. What will we do to catch up? Jo Tyndall also stated that the Government would be working out a “carbon budget” for New Zealand from now until 2020 – this will be a very interesting exercise. So many questions. But one thing we do know is that a particular set of words remained in the final Lima text, to be negotiated next year: a global goal of zero emissions from fossil fuels by 2050. How does this sit with Simon Bridges’ fossil-fuel-engorged energy agenda? There are so many challenges for us over the coming year. Let’s hope there are many here in Aotearoa who are willing to hold our Government’s feet to the fire and get a strong climate push towards Paris.